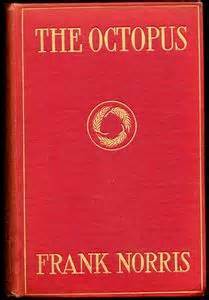 Octopus, the title referring to the railroad trusts that dominated the American West in the late nineteenth century, is Frank Norris’ epic novel. It is the first part of his planned “Epic of Wheat.” Octopus would explore the production of wheat in the American west. The next novel (which is not collected by the Library of America so I will not read it now), The Pit, is about the processing and sale of wheat in Chicago. The unfinished final novel, The Wolf, would have looked at famine relief in Europe, ending the epic with the consumption of wheat. 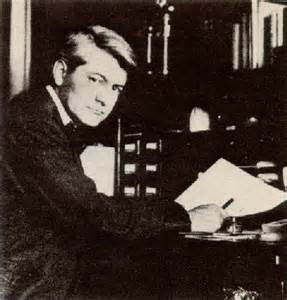 Norris died before he could begin work collecting material on the final novel. The trilogy was as much about power as it was about wheat. 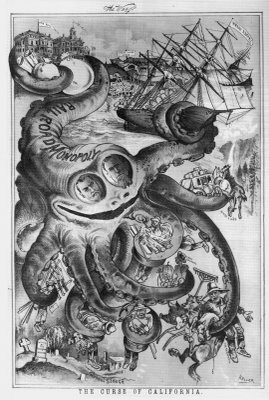 The Octopus was one of the best novels I have ever read on power of capitalism to squeeze and exploit producers and the difficulty of opposing that power from within the system. Much of the tension in the first half of the novel is about the different strategies of San Joaquin valley ranchers to oppose the growing power of the railroad over their lives. By the period described in the novel, the farmers of the west were transformed from subsistence farmers into petty businessmen cash croppers, tied into market networks that they did not create or control. From the perspective of the ranchers, the railroads are a malevolent force, an almost Lovecraftian horror. There is an entire host of issues brought up on the ranches by the presence of the railroad. The price of land is set by the railroad companies that claim that their “improvements” demand compensation in higher land prices and freight rates. The farmers, regardless of the success of a harvest, are tied to steady or rising rates. (The novel is set during some hard time for the ranchers, threatening smaller land holders with bankruptcy). Many of the farmers are indebted and are hoping for a “bonanza” year after a couple years of drought in order to pay off their debts. The high railroad rates threaten their recovery. Another issue had to do with ownership and pricing of land owned by the railroads but improved by the ranchers who leased the land. The railroads eventually threaten to sell this land to speculators. One of the more prominent men in the small community of ranchers, Magnus Derrick, had a history of being active in politics and sees the solution in political action. He hopes to elect members of the Interstate Commerce Commission and the Railroad Commission in order to keep the rates low. Others are more skeptical and confess the need to bride candidates directly to prevent them from becoming tools of the railroads. Another rancher, Annixter, reflects a more radical voice who sees politics as ultimately corruption and expresses total fatalism over their prospects of resistance. He refers to previous failed efforts to mobilize the regions farmers (perhaps suggest the era of the Farmers Alliance and the Populists although the inspiration for the plot took place around 15 years before those movements took off). Despite their differences, these ranches essentially are calling for a democratic economy in which they can have a say over the price of freight, which when rose too high means the difference between destitution and survival (regardless of how hard they work or how lucky they are in a harvest). The signs of a farming economy in transformation are everywhere in the novel and are particularly conspicuous in the descriptions of the technological transformations taking place on the ranches. At the same time, the collective efforts during the plowing season (described in chapter four of part one) harken back to old American values of cooperation and rural solidarity, something rapidly being undone by the forces of the railroads and industrial agriculture. The collective labor in raising a barn are other memories of the American agrarian ideal. The romantic side of American rural life is represented by the sheep rancher Vanamee and the poet Presely. He sustained a mystical relationship with the land, unlike the more business approach of the larger ranch owners, especially Derrick. He is also the one who sustained a real religious perspective, cultivated by his mystical relationship with the land. What I found most striking in the first half of this novel is how fearful the ranchers were of the railroad. The language that runs through the novel is that of a horror novel. 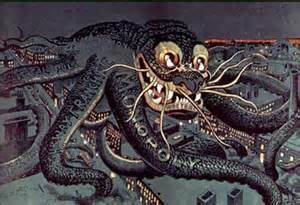 “[T]he leviathan with tentacles of steel, to opposed which meant to be ground to instant destruction beneath the clashing wheel. . . . A leviathan with a heart of steel, knowing no compunction, no forgiveness, no tolerance; crushing out the human atom with soundless calm, the agony of destruction sending never a jar, never the faintest tremor through all that prodigious mechanisms of wheels and cogs.” (719, 720) The three major responses Derrick (fight with reason and argument), Osterman (resist with all force), and Annixter (fatalism) are all logical responses to this overwhelming and malevolent power. Part one of The Octopus ends with the organization of the ranchers into a political force. The railroad issues letters to the ranchers (who are tenants) that their land will be sold on the market at rates that none of them can afford (they were earlier promised 2.50 an acre). This emerges from rage over the railroads schemes and the charisma of Osterman. They form what is in essence a local farmers’ alliance. “Everyone one of us here to join it, to form the beginnings of a vast organization, banded together to death, if needs be, for the protection of our rights and homes. Are you ready? Is it now or never? I call for a League.” (797) Magnus Derrick is elected the president of this organization. The stage is set for an epic confrontation between producers and capital. This entry was posted in Capitalism, Class Conflict, Democracy, Fate, History, Library of America, Political Thought, Radicalism, Resistance, Technology, Working-Class Life and tagged class conflict, epic of wheat, farmers alliance, frank norris, populism, railroad monopoly, ranching, the octopus. Bookmark the permalink.